In November I had the pleasure of visiting Fancy Tiger Crafts for the first time, and I went in with the plan to hit their fabric section hard. I am happy to support online fabric stores, but there’s nothing like getting to touch the bolt in person to help you pick a match for a pattern. That was certainly the case for this fabric - I wouldn’t have looked twice at this on a website, but in your hands this tencel french terry is incredible - soft and cozy and delightful. I had wanted to sew Tacara since it was first released, and this was perfect for my vision of a thick, snuggly fabric. The pattern was super quick to sew up and my only modification was to remove 4” from the length (hi, I’m 5’2”). One change I wish I had made was to place the pockets higher - I have to slouch to get my hands into them currently. Next time I will try to remember to try on the dress once the shoulders are sewn so I can check pocket placement in the mirror. One fun thing about this pattern is that I was able to borrow a coverstitch machine while I was working on it. I had never used one before, but it sure does make my hems look gorgeous. I normally use a narrow zigzag on my knits, but I think I’m going to get serious about saving up for my own coverstitch to be able to add that touch more often. Today is the first day of a cold front here, so I’m looking forward to snuggling up in my new dress! Hello! At the start of 2018 I didn’t want to set any goals or make any plans. I was living with a lot of unknowns and wanted to avoid adding self-made responsibilities to my plate. As 2019 dawns I have answers to many of those questions and they make me want to approach this year differently. I try to keep this space devoted to my crafting, but I’m going to briefly share an update on my health, as it’s the motivation behind all of this. I have chronic colorectal cancer, which means that my at least with current medical treatments my disease cannot be cured. I’m going to be doing chemo every other week for the foreseeable future. There’s a rhythm to the cycle, and I’m ready to have some goals to work towards, wherever I may be each day. I love crafting books, and I’ve amassed a huge collection of unread ones. This year I’d like to get through all my unread paper books, most of which are craft books. You can see the list of all these books on the associated Goodreads shelf here. I’ll be sharing some of my favorites on the blog, starting with Kate Davies’ Handywoman later this month. Thanks to a night of sleeplessness earlier this week, I went through my entire pattern and fabric stashes and set up an exciting queue for myself. Sewing has been hard for me the past year - between pain and exhaustion it has seemed out of reach to accomplish the physical tasks involved in getting projects going. With the mental work of this queue done, I am ready to tackle my fear and go for these projects. At a sewing weekend later this month I’m hoping to add some much-needed knits to my closet with a new dress and a couple new tops. My goals for the year include a jumpsuit and pants, both firsts for me. My knitting was side-lined last year when I developed carpal tunnel (Listen to your bodies, y’all! Don’t push through pain!). I took 2 months off entirely, and since then have been working on it in PT. I can do some knitting know and hope to increase my stamina in the coming months. For the Ravelry Project Challenge I set a goal of 6 projects - definitely on the list are a bunch of boxy cropped sweaters and I’d also like to knit up some accessories with some kits and other perfectly matched skeins in my stash. To make sure I hit new year’s blog post bingo, I have to include that I would like to blog more regularly this year 🙃. But truly, it is one of my goals to get back to weekly posting. I’d like to include more writing about crafting, and not just my personal projects. If you have something you’d like to hear my thoughts on, you can tell me in the comments below or email me from the contact section! Looking forward to another year with you, dear readers! And, if you do want to keep up with my health, you can read about that on my cancer blog at bearingthewait.com. Y’all, this is the worst thing I have ever sewed. 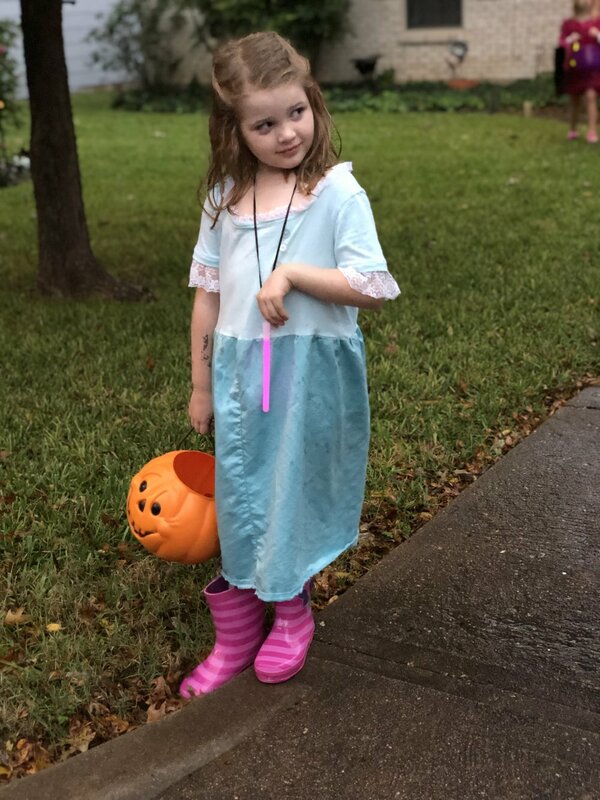 When my daughter decided she wanted to be Eliza Hamilton (Alexander Hamilton’s wife) for Halloween I knew it was time to sew my first costume and was psyched to pore over pictures and plan. But when it came time to sew I had so little energy and time and just had to dig deep and make it happen at the last minute. I want to show you all the issues with this dress. The skirt is backwards and also needs more volume. The neckline is a mess. The hem flips up. The buttons don’t line up. But the second I presented it to my daughter she swooned: “it’s so beautiful!” As soon as she put it on she carried herself tall, clearly feeling so beautiful and proud. My daughter’s love for the dress makes me uncomfortable. It doesn’t look like what I imagined and it feels like a flop. I was embarrassed to say yes when adults asked if I made it. But my daughter loves it and feels like a founding mother and can’t wait to keep playing Hamilton around the house. She feels special that she has a mom that can make her things. So do I want to focus on the ways I feel like I failed or on the joy I brought my favorite 7 year old? Am I going to tell her that no, this dress isn’t amazing, it’s full of flaws? She felt great and had a blast Trick or Treating, so I can’t call this anything but a success. I am a sucker for anything with buttons down the back. It think it is such a beautiful, interesting detail. 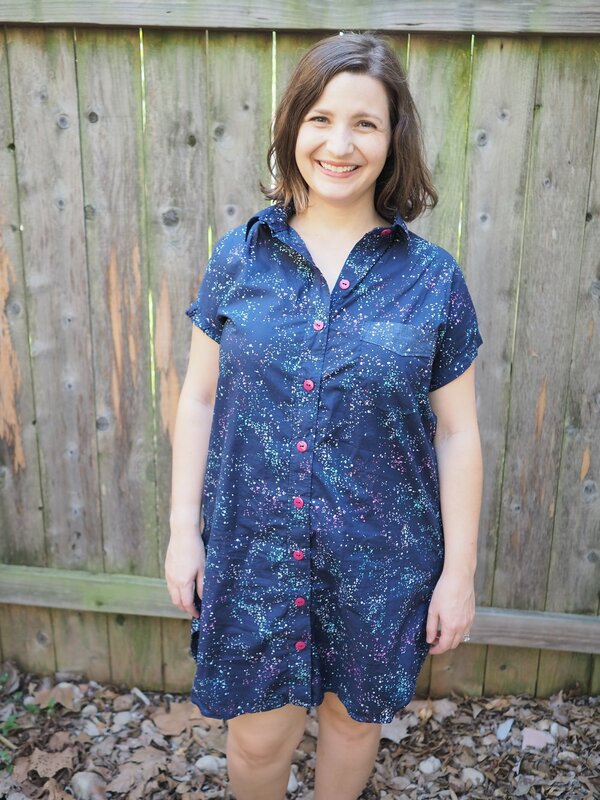 I loved that the Trevi Dress page has a sample in this same fabric in a different colorway, so I knew that it was a good canvas for this gorgeous print. I love how it came out grading 3 sizes from the bust to the hip. I think it skims my shape beautifully and I feel great in this dress. One of the things I liked about this pattern is that it came with a version with the FBA built in. I used that one and while I know the fit would be better if I had done my own, I'm pretty pleased with it. I enjoyed the construction of the dress. It's straightforward with the button plackets part of the back pattern pieces rather than separate. I think it makes for a cleaner and more comfortable look for the back of a garment. I'm torn on whether I should have lowered the front neck a bit. I always look at the dress and feel like it is going to be uncomfortable there, but in actuality it is not. My sewing queue is all summery dresses and the weather is still meltingly hot here, but I am dreaming about more cold weather garments. Have you made the seasonal switch in your crafting or not yet? Fabric: Cotton + Steel Rifle Paper Co Wonderland in Light Blue Metallic, Cotton + Steel Rifle Paper Co Cameos in Rose and Verna Mosquera Indigo Rose Vintage Pindot in Cherry. More old FO catch up! My daughter loves Alice in Wonderland, so of course we had to get some of the Rifle Paper Co Alice in Wonderland fabric when it was released. There were two patterns she loved so we got a bit of each. 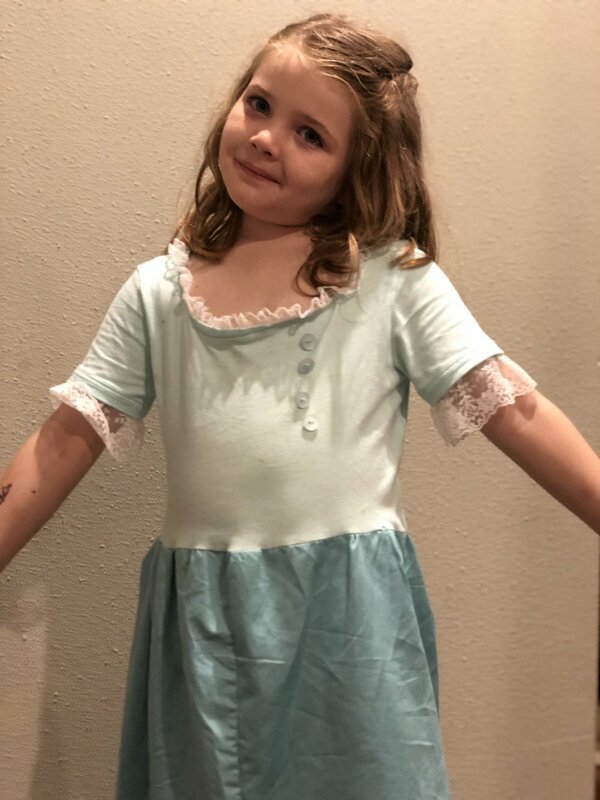 I chose the Sally Dress because it has no closures - my daughter prefers dresses she can pull on straight overhead, and I wasn't sad to skip installing a zipper. I also loved that the pattern had a fully lined bodice, which gave me an opportunity to use both beloved patterns. And then it occurred to me that it wasn't much more work to add a skirt to the bodice lining and make a reversible dress! 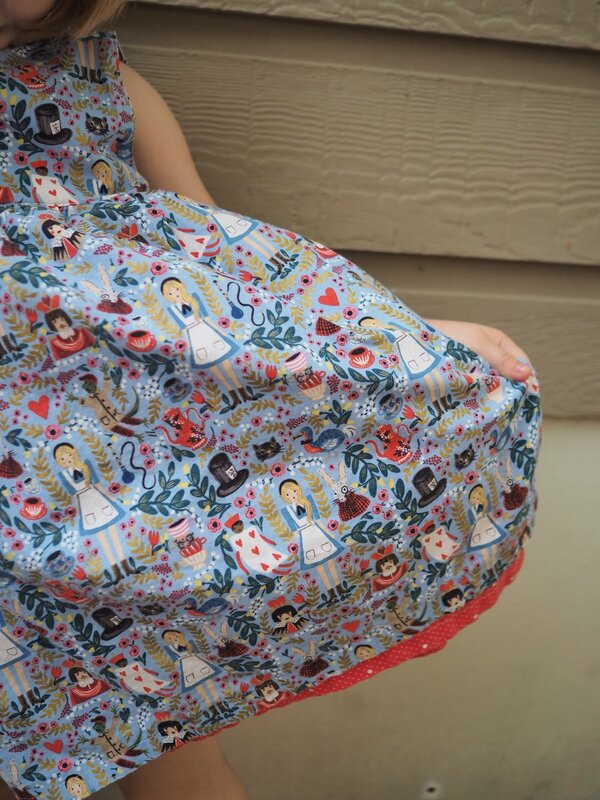 The reversible dress meant I could show off the beautiful lining fabric, too! Making it reversible didn't take much longer, and the ease built into the dress means that there's plenty of room for two skirts. I tried to construct the pockets like a RTW reversible dress we own and that added a lot of time (and no, I didn't figure it out). But it has pockets and two sides and I think it is super pretty. I am particularly proud of the pattern placement on this dress. I managed to center Alice on both bodices, and on the blue side she's also at the top of each shoulder framed by metallic laurels. I managed to estimate the seam allowances correctly, which is a skill I am working on. The final thing I want to talk about with this project is a mistake I made and how I recovered from it. 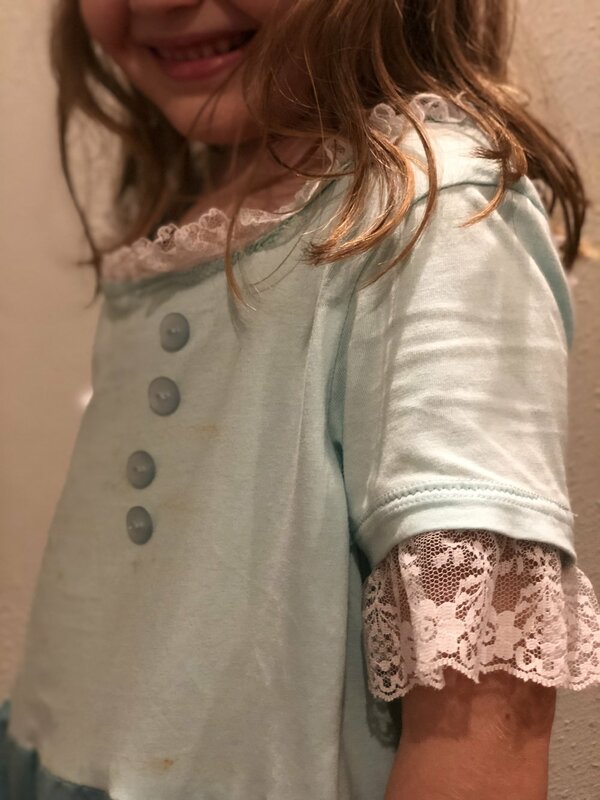 When I was serging the blue bodice to the skirt, I accidentally caught part of the bodice fabric and made a hole (and yes, Alice's surprised face right over it makes me laugh). At the time I had recently learned about the Japanese practice on Kintsugi - repairing broken pottery with gold. It is a practice that sees flaws as part of the history of the object, rather than something to hide. I channeled this and mended the hole with some gold embroidery thread I had on hand. What do you think about this practice? Would you be willing to beautifully repair broken things to show off this part of their history?